This week, I’m in Sydney and we’re taking a look at the difference a year makes in FX pricing across the globe. FinTechs have had a huge influence on pricing in the sector, with the competitive rates offered by smaller financial services companies challenging banks to lower their margins. The Australian market is becoming increasingly competitive as the big four incumbent banks shift their focus to value-add, integrated services, leaving FinTechs to sweep up the customers or form partnerships. Not shown above is the highly fragmented US banking market, a country in which thousands of banks can’t even make an international payment. While FinTech players there (many transplanted from the UK or Europe) have spent years and millions of dollars obtaining the necessary regulations to challenge the status quo, we have yet to see a significant decrease in bank pricing. However, we would not be surprised to see that change start to manifest in the coming year. Our portal and IMTI (International Money Transfer Index) subscribers can investigate more trends like these by accessing multiple years of data across major currency corridors globally, both for the retail and corporate sector. Compare and optimise your pricing internally, and support your product marketing externally. 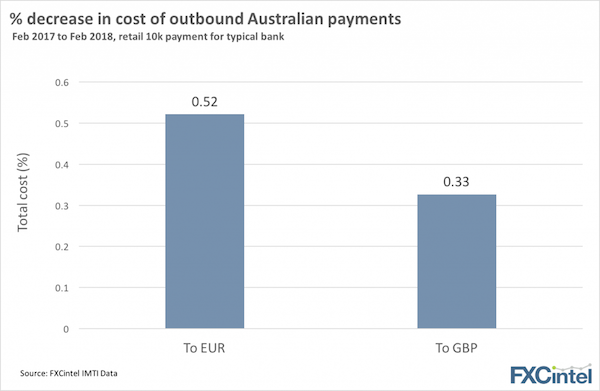 One area where we noticed a decrease was across the major Australian outbound corridors – in the space of a year, the average cost among major banks for a 10K AUD transfer into Euros fell by over half a percentage point, while the AUD – GBP corridor saw a decline of around a third of a point. Revolut announced this week that they “broke even” in December of last year. Revolut also announced they had passed 1.5 million registered users (and have 350K active daily users). This puts them somewhere in the same ballpark as Transferwise, which announced in May 2017 it had over a million customers and was on track to add an additional million through May of this year. While the companies’ business models and user acquisition strategies are different, Revolut has clearly found a fast-track to growth – it took Transferwise approximately six years to hit a million customers, while Revolut cut that to four. Transferwise came in offering very cheap money transfers. Revolut followed by offering transfers for free. If the trend continues, we’ll soon be paid to make international payments. Someone please find me a venture capitalist who thinks that’s a sustainable model.